I log stuff. Many years ago I set up an NTP server for my LAN using a USB gps. Then I decided to log the position as well. Perhaps a silly thing to do since the gps is fixed to the wall of my house, but why not. Perhaps something interesting might come out of it. This was in 2005. Now the gps position has been recorded every second for 8 years. It's time to see if the data can be used for anything. For instance, can a $50 gps be used to detect land tides? Let's find out! To detect land tides we're going to need cm resolution, which gps's don't have, but then I have a lot of data to average. So let's see if there is any correlation between the altitude and the Moon's hour angle. And there is! Below is a plot. I've been using a two moon tidal hour average (i.e. each point on the graph is an average of the altitude when the hour angle is within ±1 of the x axis value modulo 24). As expected, there are two peaks. The amplitude is about 43 cm, but the smoothing has surely reduced it a bit, so the real signal probably is in the 50-60 cm range. This looks all good to me. But, is my methodology sound? Can I measure land tide this way? I mean, the gps satellites themselves are also affected by the Moon's gravity. If the positions of the land and satellites of it are shifted roughly equally, I wouldn't see anything. Or if the satellites are shifted more (and roughly equally), I'm not really measuring land rise, but satellite rise over the ground. There also is a clear head and shoulder shape. I'm not sure how that could be explained. EDIT: The amplitudes of the two peaks are slightly different, too. Which could make sense. The Moon is further away once a tidal day, when on the opposite side of Earth. I mean, the gps satellites themselves are also affected by the Moon's gravity. If the positions of the land and satellites of it are shifted roughly equally, I wouldn't see anything. Or if the satellites are shifted more (and roughly equally), I'm not really measuring land rise, but satellite rise over the ground. Satellites can't be shifted as Earth's surface. Moon gravity simply makes their orbital plane slowly spin around some axis. But GPS supporting team constantly monitoring satellites motoin, Earth rotation (relative to quasars, btw! ), and tons of varoius factors, so satellites orbits are defined with very high precision, and this data constantly updated. So GPG must get absolute error of few meters at any time. The other thing, is increasing precision by making many observations and average them. The error will decrease as square root of number of observation. This is commonly used method in science. For example, single measurement of star velocity have precision of 50-100 m/s, but collecting data of many years of observation allowing to reach precision of few meters per second, and discover small exoplents orbiting it. In your case, you must average only data obtained in the same condition. I.e. relative position of the Earth (including rotation angle), Moon and Sun must be equal. This is highly unpleasuble, because Earth rotation and orbital period is not related with Moon's orbital period, and Moon's orbit have precession with 18.2 years period. These strange secondary peaks may be explained by Sun's tidals, which is 1/2 magnitude of Moon's, and not synchronized with them. The error will decrease as square root of number of observation. Yes. While I've made one reading per second, each measurement isn't independent of the previous, so in reality I have much fewer observations. And there might be a noise level that I can't get below because of inaccuracies in the computations made by the gps and gps system. Another thought: Are the geoids used by gps's static? 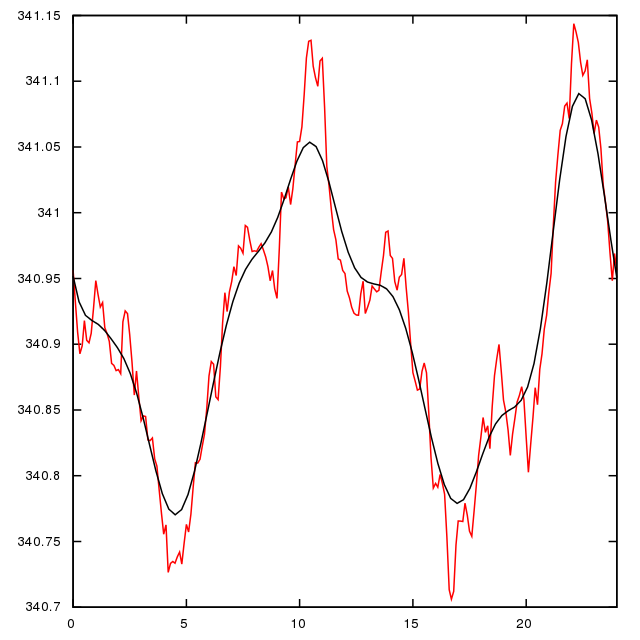 If the gps uses a geoid model which takes tides into account, the signal could simply reflect that model. But for now I'll assume that the signal I got indeed are land tides. If I continue logging this way, perhaps I could detect continental drift...? I'm not sure how that would work. If the reference for longitude is Greenwich and the satellites are updated accordingly, east-west movement would be hard to detect since Norway hardly drifts much relative to England.